Proprietary Name: Rite Aid Pro Defense Whitening What is the Proprietary Name? 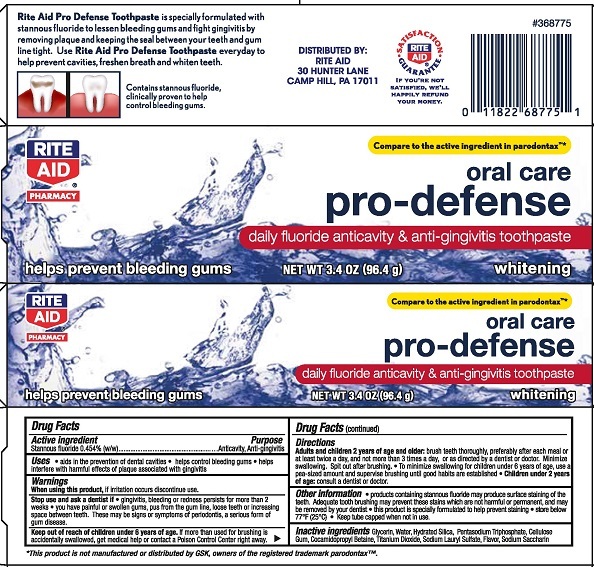 Rite Aid Pro Defense Whitening with NDC 11822-6034 is a a human over the counter drug product labeled by Rite Aid. The generic name of Rite Aid Pro Defense Whitening is stannous fluoride. The product's dosage form is paste, dentifrice and is administered via dental form. Stop use and ask a dentist if:gingivitis, bleeding or redness persists for more than 2 weeksif you have painful or swollen gums, pus from the gum line, loose teeth or increasing space between teeth. These may be symptoms of periodontis, a serious form of gum disease. To minimize swallowing for children under 6 years of age, use a pea-sized amount and supervise brushing until good habits are establishedChildren under 2 years of age: consult a dentist or doctor. Other information products containing stannous fluoride may cause surface staining of the teeth. Adequate tooth brushing may prevent these stains which are not harmful or permanent and may be removed your dentist.This product is specifically formulated to help prevent stainingstore below 77°F (25°C)Keep tube capped when not in use.